I’m going bullet point/brain dump style today, which seems to work for me when my brain is just not really flowing together and I have a bunch of weird bits and pieces floating in my head because sometimes it’s just all sdodknfjngdfjng up there, ya know? Roll with me here. – This milkshake has been in my brain for weeks. 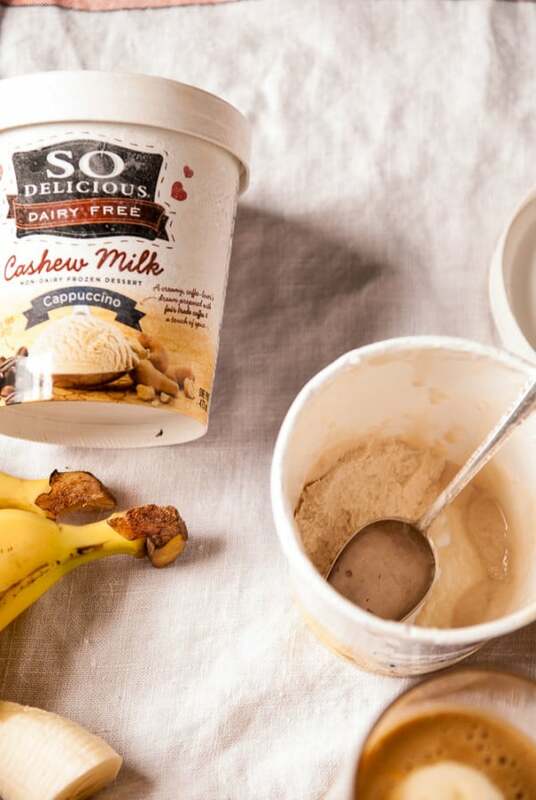 I knew I wanted to caramelize some bananas and blend them in with this cashew ice cream. The result is super sweet, way easier than you think and kind of taste like breakfast for dessert. 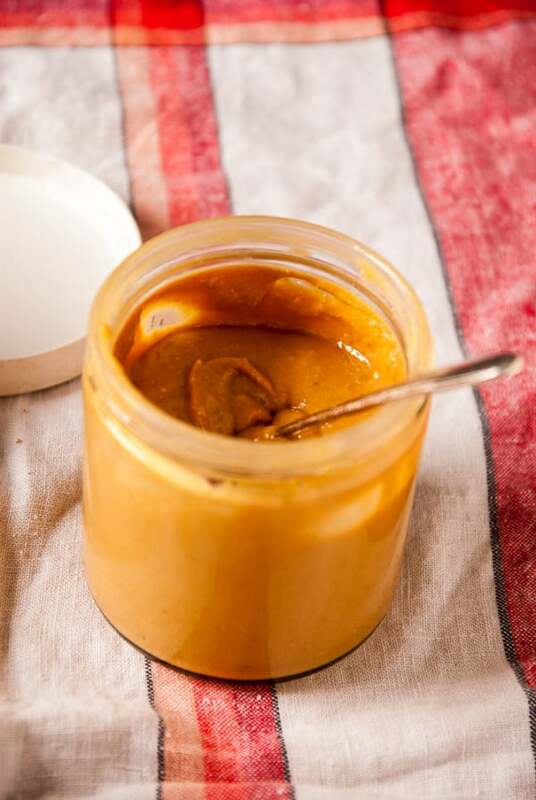 Banana+peanut butter will always be a match made in heaven for me. – I’ve been hitting the podcasts hard lately and am really into One Part Podcast and Chopped Podcast. I’m hoping to attend Chopped Con this year after hearing what a great experience my friend Phi had. Any other food bloggers attending conferences this year? I just wish I could go to ALL of them, but something about flying around the country all year would get a bit expensive, right? -I made/ate a full batch of Ashlae’s peanut butter cookies last night and I’m not really even ashamed. To be fair, they are really small and super easy to make, so batch number two may just go to work with me tomorrow. – I’ve been making a list of dinner recipes that I like and my fiance will gladly eat, since he still eats everything and at times, it seems like I eat all the opposite things. Potato soup with a side of cornbread are always a standby, along with the best baked falafel I’ve come across so far! – I have a few weekends full of brunch this month and last weekend I went to my favorite brunch place in Milwaukee and this weekend we’re trying out a new to me place that I’ve heard great things about. Brunch time= all the time, please. Now onto the recipe! So Delicious graciously sent me a few flavors from their new cashew based ice cream line and you all know how I love a good cashew based ice cream. If I were going to buy an ice cream from the store, it would be this one! I went through the Snickerdoodle and Caramel Cashew flavors within the first week and am rationing out the last of what I have in my freezer. 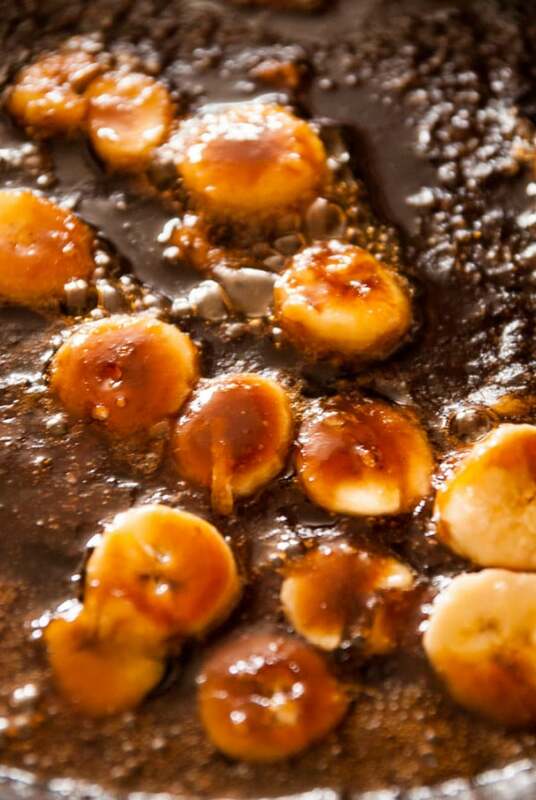 If you think caramelizing the bananas is an unnecessary step, think again! 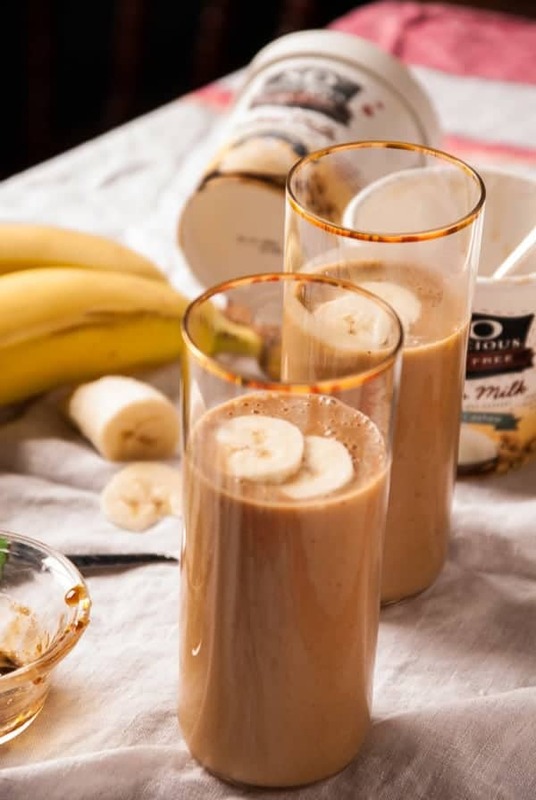 It takes maybe 5-7 minutes tops and just adds another level of sugary sweet flavor to this banana milkshake, so just pull out that pan and do it. 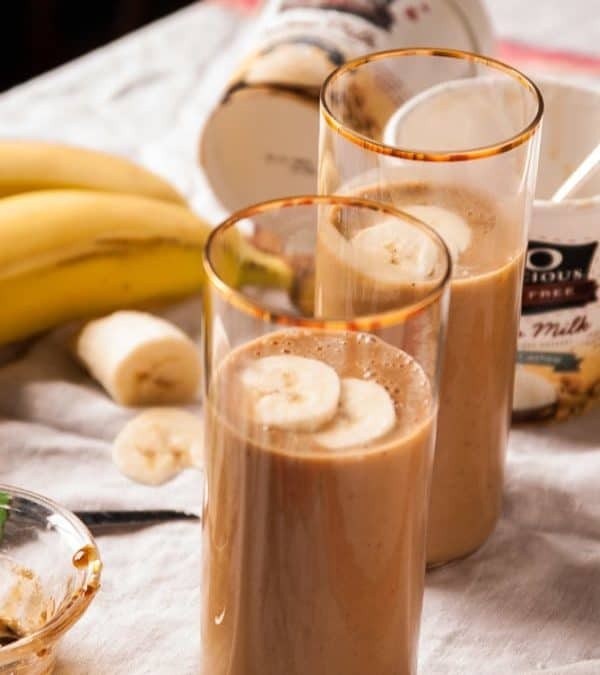 Sweet caramelized bananas and peanut butter are the perfect combo in this easy vegan milkshake! In a cast iron skillet, heat the brown sugar, vanilla extract, sliced banana and a tablespoon of water oven medium high heat. Stir together and continue cooking until brown sugar starts to bubble up and thicken, this should take about 3-5 minutes. Transfer mixture to a blender and add the remaining 2 bananas, ice cubes, ice cream and peanut butter. Blend together until smooth and creamy. 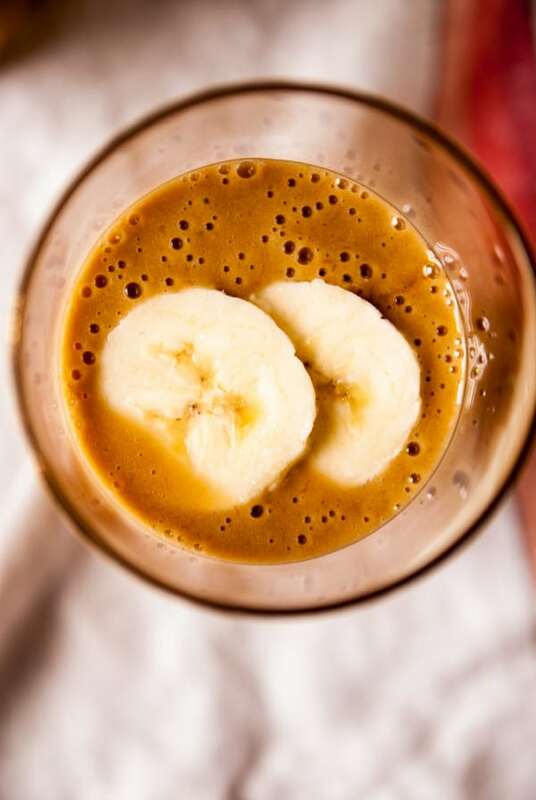 Peanut butter and banana makes me weak at the knees. And in milkshake form? Hello, lovely. Ohhhhhh girl. You’re so on point with all the things. 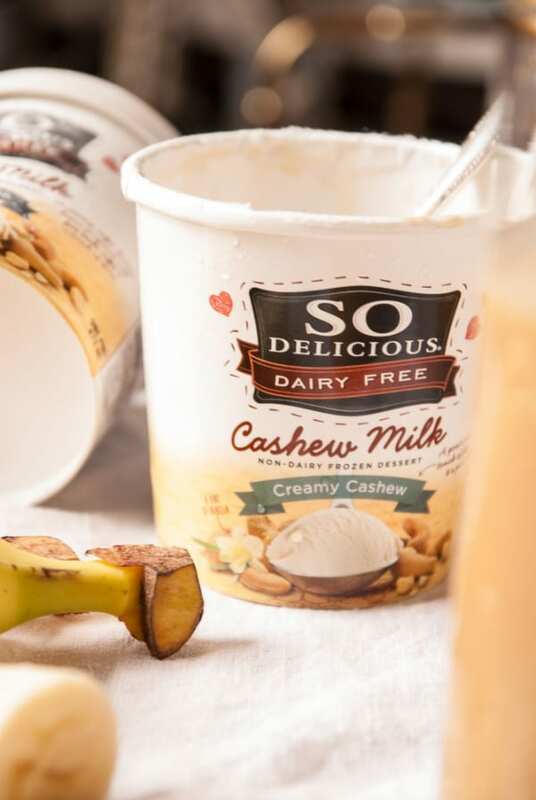 I love SD’s cashew milk ice cream…I’m pretty sure it’s my favorite non-dairy ice cream out there. 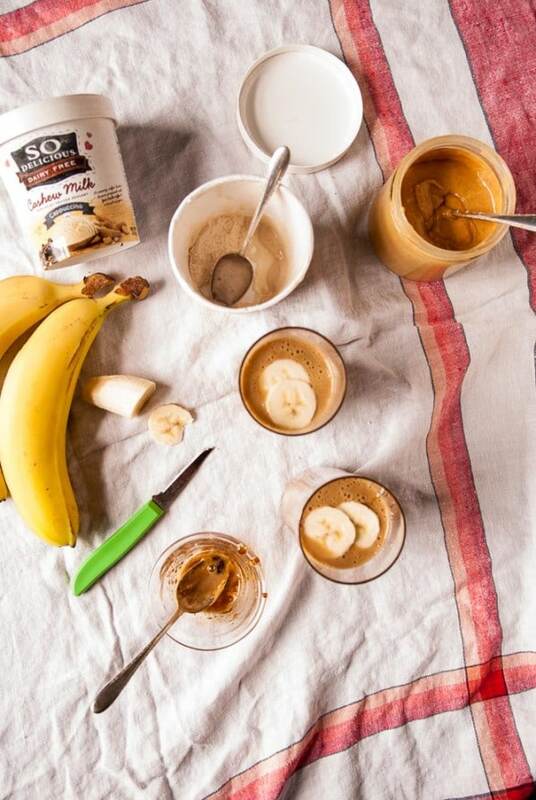 YES to caramelized bananas +peanut butter you sinful genius, you! Can we please brunch time all the time together and talk in bullet pointed lists? Mkay thanks! Mmm the caramelized banana in this sounds especially delicious! Yum! I have NEVER tried SO DELICIOUS and um, WHY THE HECK NOT?!? I mean, it’s SO DELICIOUS right? ha! Haha yes!! It is seriously so so good! sometimes bullet point/brain dump style is the way to go!!! 🙂 I haven’t seen those easy peanut butter cookies before so thanks for sharing!!! and love this banana peanut butter milkshake!!! fabulous! and that cashew based ice cream line sounds so good!!!! Ahh thank you Alice!! Hope you have a wonderful week ahead!! Oh wow, this sounds amazing, Abby! I’ve been craving a milk shake lately, and this one would quench my craving, I’m sure of it! Haven’t tried So D’s cashew ice cream, but should give it a go. It sounds fabulous! Chopped sounds fun, but I won’t be there… heading to IFBC this September… and yes, all the fabulous conferences; one could spend a fortune flying around and hitting all of them. Lets just take the year off and do it, shall we? ! hehe! Wow girl, these milkshakes sound amazing! And I totally have those brain dump days, with these milkshakes though, we can take on the world! Wow I’m totally going to try this next time I want a treat! !